Hunters argue that their activities only take out older animals that are past their breeding lives and therefore have fulfilled their purpose. Such specious claims have been perpetuated for decades and have been mostly accepted by a gullible audience. Science shows clearly, however, that the elderly of many species still breed and make a vital contribution to the structures of their society. Removing them artificially upsets all sorts of behaviour around reproduction, collective wisdom and, certainly in the case of elephants, discipline within herds. By PETER BORCHERT for UNTOLD AFRICA. First published by Untold Africa. For me these questions were thrown into sharp relief when a meeting between South African government officials and representatives of Safari Club International (SCI) took place in a town called Polokwane in the far north of the country. For those who may not be familiar with SCI, it is arguably the biggest and politically most powerful hunting club it the world. Within its embrace the wealthiest and most ardent of its 25,000-plus members compete to have their names inscribed in the SCI Record Book. For 60 years the entries in this hallowed tome have commemorated, in meticulous detail, the feats of hunters and the trophies they have brought down by arrow, bullet and bolt. All in the name of sport. It doesn’t end there, not by a long chalk. Trophy hunting is an intensely competitive pastime and SCI acknowledges the grandiosity of members according to a strict, medieval-sounding hierarchy ranging from Grand Slam Awards, Inner Circle Awards, the Fourth Pinnacle of Achievement Award, the Crowning Achievement Award and, finally, the Nimrodian height of glory itself – the World Hunting Award for which the qualification requires an astonishing array of kills, including the African 29 Grand Slam – a list of species from which 29, including three of the big five, must be taken. And this is just an outline of the many arcane sub-categories of CSI awards that in the case of Africa have resulted in the deaths of 2,007 lions, 791 elephants, 572 rhinos (including 93 black rhinos listed as Critically Endangered), 1,888 leopards and 3,238 Cape buffaloes since its inception. Then there are thousands of other animals felled for some or other desirable anatomical attribute. Of course there are other powerful hunting clubs in the world, and hunters come from everywhere, not just the United States. And it is only fair to add that even in America there is far from universal approval of hunting – in fact a 2014 poll conducted on behalf of the International Fund for Animal Welfare (IFAW) found that more than 80% of Americans surveyed support the banning of lion and elephant trophies. Relative to the world population, the proportion of sport hunters is really very small, and of those the trophy hunters are but a fraction again. However, they are a very wealthy few who individually and collectively wield a lot of clout. So, it was understandable that SCI’s meeting in Polokwane in the heart of South Africa’s big game hunting industry caused a ripple of disquiet through conservation circles, not because the meeting took place, but that it did so behind closed doors. Why the secrecy? Why was the media not welcome? Well that seemed pretty easy to work out: the hunting industry, especially the trophy aspect of it has been somewhat on the back foot recently, especially here in Africa. Witness the world-wide outrage at the inexpert murder of Cecil the lion and the subsequent slaying of a great old tusker in south-eastern Zimbabwe. And then the hard-hitting film Blood Lions exposed the shameful horrors of canned hunting. First it was shown to select audiences in South Africa, but now it is being increasingly screened at festivals and venues all over the world. Even Discovery Channel aired a one-hour cut. Add to this the increasing number of airlines refusing to carry lion trophies out of Africa, the banning of the importation of lion trophies and lion body parts into Australia, increasing anti-trophy import actions in the US (including listing the African lion in terms of the US Endangered Species Act, which makes the importation of trophies illegal) and one begins to understand how beleaguered trophy hunters must be feeling. Furthermore, with Blood Lions filmmaker Ian Michler now in an ongoing engagement (see “The turning tide – Blood Lions v lion breeding and canned hunting”) with the European parliament to have the import of lion trophies banned across the EU, 2015 was something of an annus horribilis for the hunting fraternity. So who better to turn to than an old friend with a sympathetic ear: The South African government. No doubt SCI and their supporters will have gone to great lengths at the meeting to show their activities in the most positive light possible, and to reinforce their much-vaunted contribution to the economic development of African countries that allow hunting, their services to conservation and the provision of all-important jobs in impoverished local communities. The great chalice of trophy hunting would have been taken out, burnished and much admired as all the old chestnuts were laid out for discussion. Almost certainly one of the first items on the agenda would have been the claim that the trophy hunting industry generates some US$200-million in revenue across remote African rural areas. A lucrative activity indeed. But for whom? For a start, The $200 million question, a report by Economists at Large suggests that the contribution claimed is at best a rather shaky guestimate that should be used with caution. But even if we accept the figure at face value, further investigation reveals that very little actually accrues to rural communities alongside hunting areas. Only about three per cent in fact. The vast majority goes to commercial firms, government agencies, overseas or stays in regional capitals. Moreover, any amounts that do go to government coffers rarely end up in communities thanks to corruption and other questionable spending priorities. Of course US$200-million is not to be sneezed at, but in the context of economies as a whole it represents a fraction of one per cent of the collective GDP of the countries reviewed in the report. What’s more, it transpires that across the board trophy-hunting revenue amounts to a mere 1.8% of total tourism receipts. Perhaps not too surprising in light of a study by the Nelson Mandela Metropolitan University that estimated ecotourism on private game reserves generated “more than 15 times the income of livestock or game rearing or overseas hunting”. And do hunting camps contribute meaningfully to employment as the industry claims? They do provide jobs, for sure, but they are generally seasonal, poorly paid and without much security considering the dangers involved. Also hunting camps tend to be basic, with very low staff compliments. Photo safaris on the other hand mostly operate all year and run to high standards of accommodation and services that engage a substantial staff complement. There is also a far greater security of tenure and the opportunity to learn hospitality and conservation management skills that can and do lead to life-long careers. Clearly the economic development importance of trophy hunting is greatly overstated. Certainly it adds little real nourishment to the poorly stocked larders of conservation. The arguments justifying trophy hunting extend well beyond the economic claims. Hunters argue that their activities only take out older animals that are past their breeding lives and therefore have fulfilled their purpose. Such specious claims have been perpetuated for decades and have been mostly accepted by a gullible audience. Science shows clearly, however, that the elderly of many species still breed and make a vital contribution to the structures of their society. Removing them artificially upsets all sorts of behaviour around reproduction, collective wisdom and, certainly in the case of elephants, discipline within herds. Then there are the assertions that hunters keep vast tracts of Africa in a near wilderness state and that their activities add to vigilance against poaching. This might be true in some cases of privately owned land, but it can’t be used as a sweeping generalisation. Certainly the lion breeding and hunting farms that have burgeoned in South Africa are little more than ecological deserts – they have no conservation value at all. Witness, too, the situation in Tanzania, one of the great hunting destinations in Africa. The fact that some 60% of the country’s elephant population has been lost to poaching in the past five years makes one suspect that “hunter’s vigilance” is not quite the anti-poaching force it is made out to be. And so the arguments and sometime insults and threats are traded back and forth until we reach a state where the “Yeah but, no but” arguments (often ending in irrational conclusions on both sides of the divide) are worthy of Vicky Pollard, the obnoxious teenager from English cult comedy series Little Britain. One thing is for certain, the South African Professional Hunters’ Association (PHASA) has been squarely confronted by the less savoury aspects of their world, to the extent that the association has finally and formally turned its back on the controversial practice of captive-bred lion hunting. At the association’s most recent AGM, a majority of its members voted to distance the association from the practice “until such time as the South African Predators Association could prove its conservation value to PHASA as well as the IUCN”. 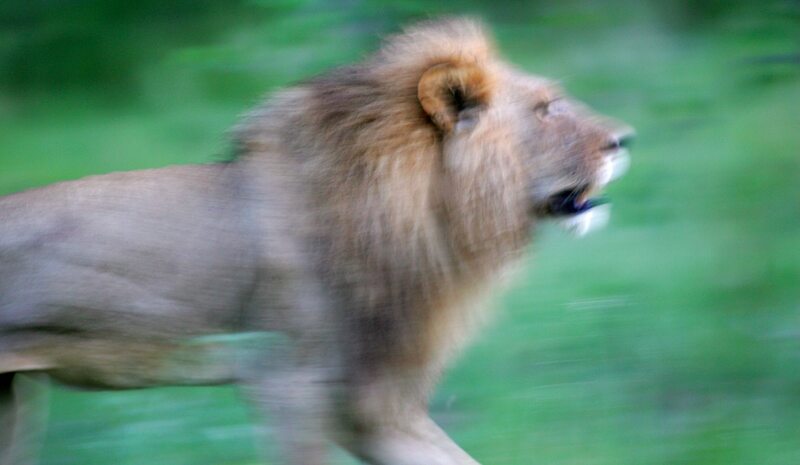 Photo: A male African lion runs while hunting in the Okavango Delta in Botswana March 25, 2005. REUTERS/Thomas White.